We have a secret service that not everyone knows about because we don't really advertise it much - although we should. Wedding invitations. We thought we'd share some lovely wedding stationery we completed recently. 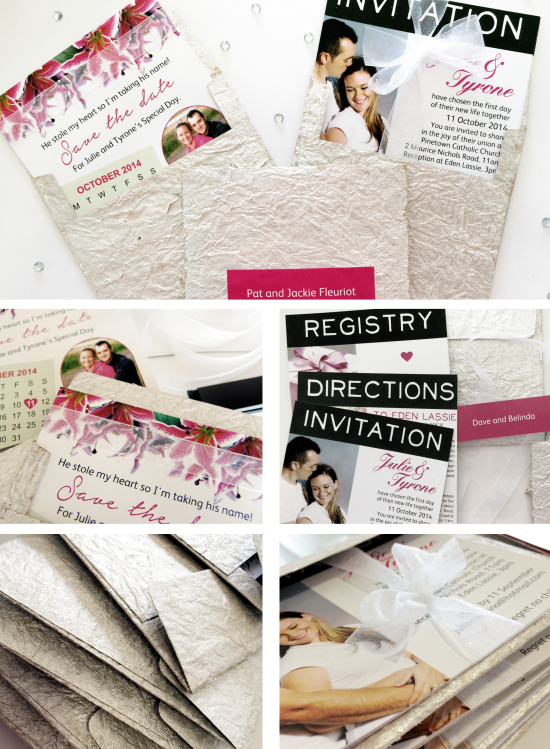 It consists of a 'save the date' card and an invitation set of 3 cards (invite, registry and directions). The client wanted a silver, white, cerise and green palette, and asked if the 'save the dates' could be a little more informal with stargazer lilies as a feature, a calendar element and a magnetic strip on the back for going onto the frige. The invites are more formal. All stationery elements were printed digitally on a crisp white matt board and we used a glitter-flecked white ribbon to tie the invitation cards together. We used handmade silver envelopes with cerise name labels to finish off the look. You can see the final product below.